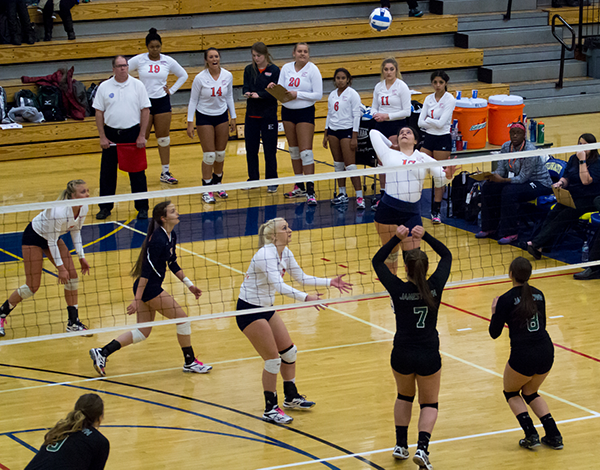 Eastfield swept Jamestown (25-16, 25-12, 25-9) in the quarterfinals of the NJCAA DIII National Championship. With the win, the Harvesters advanced to the semifinals and ended the Jayhawk’s unbeaten streak of 30 matches. In the first set, the Harvesters went behind but immediately rebounded and won seven consecutive points, six of which came from Keishla Reyes’ serves. The team held on and finished the set with a comfortable lead. The second set saw the team start with 10 points without response, with 9 on Reyes’ serves. With the score 14-6 to Eastfield, Jamestown’s SallyAnne Rudney collided with another teammate and took an elbow to the face, breaking her nose. She was taken off and the game was delayed for about 5 minutes as blood was cleaned from the court. Jamestown’s freshmen would end up playing the rest of the match without their only sophomore. In the final set, Eastfield took 16 of 17 points to lead 16-1 and ran out as victors, giving up only eight points as they took the set 25-9. Coach Brandon Crisp said the team played well and looks forward to the next match. The Harvesters play again at 5 p.m. for the semifinal match against the winner of Central Lakes vs Northampton. Follow JULIO VEGA’s sports blog and on Twitter for the latest on the volleyball team’s national tournament trip.